With summer vacation season in full-swing, more and more drivers will hit the road in the coming weeks to get to their holiday destinations of choice. Traveling by car is a top choice for many families, especially when pets are coming along on the trip. To make your summer road trip a good one for all your two- and four-legged passengers, the Massachusetts Animal Coalition (MAC), the non-profit organization behind the “I’m Animal Friendly” special license plate, has developed a five-point pet-friendly travel checklist. As the roads get crowded, drivers will have a hard time avoiding bumper-to-bumper traffic and unexpected delays on their way to and from popular vacation spots like the Berkshires, Cape Ann, Cape Cod, and the South Shore. “We’re often so focused on packing our suitcases and getting on the road to beat the traffic, we forget to consider how to keep our pets comfortable, relaxed, quiet, and occupied during what could easily turn into a long car ride during the summer,” explains Anne Lindsay, founder and president of MAC. Familiarize your pet with the car. Many cats and dogs are not big fans of automotive travel – often because the only time they are in the car is to go to the vet’s office! Put some treats or toys in your cat’s carrier or make your dog comfortable in the backseat in a crate or other restraint and take short drives to get them used to the car ride. Prepare snacks and activities. If your pet is likely to need something to keep them busy on a long road trip, consider bringing a food puzzle such as a treat ball or a stuffed Kong, or another favorite special treat. Think ahead on the treats though – anything with a fishy smell is traveling with you, too! Plan for potty breaks. Mapping ahead of time where the animal-friendly rest stops or places a dog can get out to stretch his legs minimizes the time you have to drive around searching for one. Especially if you get stuck in traffic, knowing where you can stop when he/she needs to go makes a big difference! Pack the H20. Make sure you have a bowl and water bottle easily accessible in the car so you can offer water to your pet as needed along the way. Arrange your pit stops. Pets don’t sweat and the temperature in a car can quickly rise to dangerous levels – even in cooler temperatures in the shade with the windows open. A Stanford University School of Medicine study showed a car’s interior can heat up by an average of 40 degrees within an hour, even on a mild 60-degree sunny day. Make a plan for how to handle your pit stops so you never leave a pet in a hot car! Watch The Road For The “I’m Animal Friendly” License Plate! When you’re on the road this summer, keep an eye out for the “I’m Animal Friendly” Massachusetts special license plate! 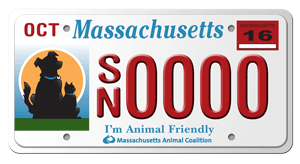 Animal-friendly drivers can support statewide spay and neuter efforts at shelters, rescue groups, and municipal agencies by purchasing the special license plate. READY TO DRIVE LIKE AN ANIMAL(LOVER)? Visit petplate.org to sign up for a reminder to order the “I’m Animal Friendly” plate when it’s time to renew your registration online with the Registry of Motor Vehicles.